FREE PHOTO Packages & More!! !| HURRY & PRINT THESE COUPONS!!! 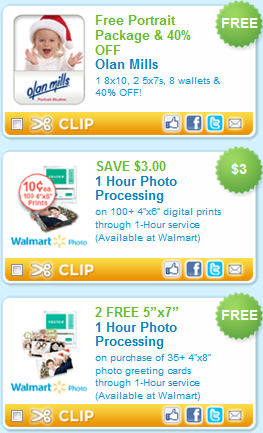 There are some great coupons available for photos right not. 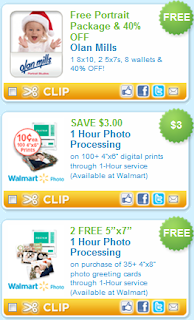 You can the Free Photo Package from Olan Mills, $3 Off 100 Prints from 1-Hour Processing at Walmart, & 2 FREE 5x7 prints from 1-Hour Processing at Walmart when you buy 35 4x8 Photo Greeting Cards and more!!! With it being the end of the month, these coupons could likely be gone soon so if you want to take advantage of these, hurry and print these out. While you are there, you need to go ahead and print out the other coupons you want before the end of the month!!! I want to see some of those photos if you get this deal!!! Print Free Coupons !! !